A Monday morning subway ride with a team of NBA players? Only in New York. 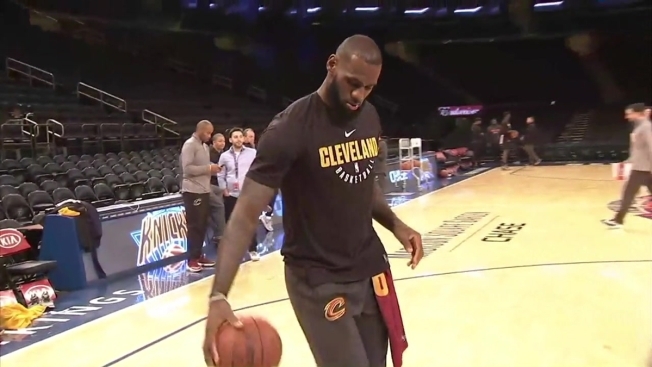 Video posted to the Cavaliers' Twitter account shows LeBron James and his teammates, in town to play the Knicks at Madison Square Garden, hopping on the subway from Penn Station back to their hotel after practice Monday morning. Former Knick J.R. Smith was among the train-taking contingent. When in NYC...do as the New Yorkers do. "We had two options: a 45-minute bus ride or a six-minute train ride, so we decided to hop on the train with the squad," James says in another video. James and Dwyane Wade managed to grab seats, but their other teammates who had to stand didn't exactly have much clearance in ceiling room. "We're squishing," James remarks as he films his teammates scrunched over in the subway car. James said it was his first time riding the subway in New York. Despite their apparent effort at staying incognito in hoodies, the players didn't exactly blend in. Eagle-eyed straphangers who noticed them on the train waved and said hello. But a man -- later identified as James Michael Angelo -- seated next to James became irritated when James pointed the camera in selfie mode toward him and says, "Can you not?" before putting his hand in front of his face. New Yorkers, after all, are notoriously hard to impress. Later Monday, Angelo posted his own video inside his office explaining himself. "I had no idea who LeBron James was, because I don't watch football," he said. The woman filiming Angelo corrects, "Basketball." "Oh it's basketball?" he says. The MTA, for its part, tweeted in response to the video: "Thanks so much for taking the subway Lebron, but the King of this town is @kporzee and we're riding with the Knicks tonight."